In 2014, Farag was part of Harvard's first national championship squad in 17 years. The Quincy House resident graduated with a degree in mechanical engineering. Ali Farag ‘14, a three time first team All-American squash player while at Harvard, rallied back from two games down to defeat World No. 1 Mohamed el Shorbagy at the 2019 J.P. Morgan Tournament of Champions in New York City on Thursday. When the new rankings come out in March, the 26-year-old will overtake el Shorbagy and become the top-ranked squash player for the first time in his career. The match was tight throughout, with el Shorbagy’s thrilling 12-10 win in the first game setting the tone. It was only fitting that it went the full five game distance, although the final point ended in inglorious fashion. El Shorbagy — the tournament’s champion in 2015 and 2016 — called for a review on a shot that Farag deemed unreturnable because his opponent occupied the space in front of him. Farag won the review, embraced his fellow Egyptian, and raised his arms to the sky, seemingly in disbelief. After becoming the No. 1 ranked junior player in the world and then spending his freshman season at American University in Cairo, Farag joined the Crimson and was immediately dominant. He played from the No. 1 position for three consecutive years and won two CSA individual national championships with a semifinal finish in his junior season. In Farag’s senior season, Harvard had perhaps its best squash season ever. With the Egyptian leading the team, the Crimson went undefeated and won 12 of its 18 matches by 9-0 scores. Three of those unblemished wins came in the team’s CSA team championship matches as Harvard won its first Potter Cup since 1998 in decisive fashion. Farag swept Trinity in the national championship game, 3-0 (11-1, 11-5, 11-5), to conclude his Crimson career. 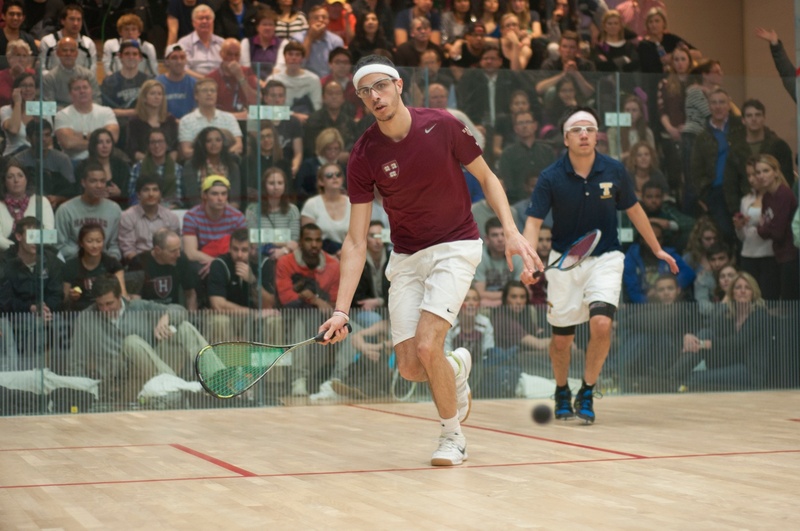 Farag’s influence on Harvard squash has gone beyond the time he spent playing for the Crimson. He became the pioneer of Egyptian squash at Harvard, convincing junior Saadeldin Abouaish to come stateside. Five years after Farag graduated, there are now four Egyptian squash players on the Crimson, two men and two women. — Staff writer Lev Cohen can be reached at lev.cohen@thecrimson.com. Comeback powers men's squash to semifinal victory. The Harvard men’s squash team executed a nearly flawless season: not only did the No. 1 Crimson (18-0, 7-0 Ivy) go undefeated in the regular season and go on to secure the national title with three 9-0 wins, but senior Ali Farag also captured the individual national crown. Of the six freshmen joining Harvard’s storied squash program this year, three hail from Cairo, Egypt. They are the latest set of top recruits from a country that dominates the international squash scene. In my German magnet schools, during a War on Terror, in monochrome suburbia, I grew ashamed of my culture.